I’ve mentioned that my bathroom is hiding a secret. The girls’ bathroom also has the same ‘secret.’ A lot of you have guessed the secret, but I’m going to show it to you today. One of the things that I don’t like is seeing electrical cords and modern devices. And so I asked my builder to add these pull out drawers that have built-in electrical outlets. 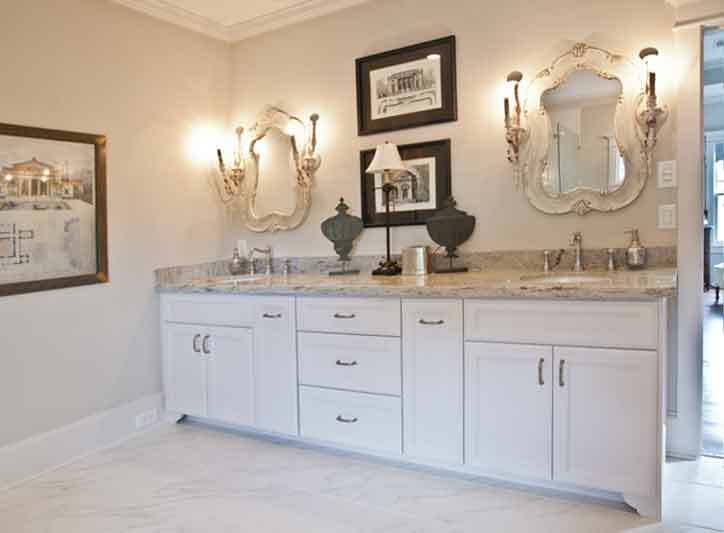 I love the idea of hidden electrical outlets in the bathroom. 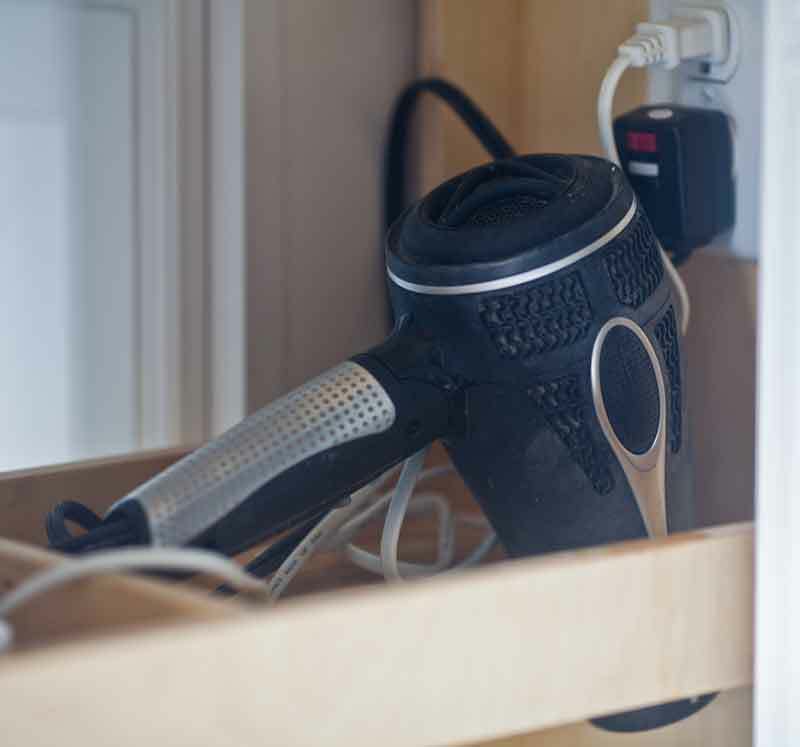 We can keep our hair dryers and electrical toothbrushes plugged in, but out of sight. They cut a hole in the drawer for the hair dryer to sit in, and a little divider to keep the toothbrush from falling over. This isn’t something pretty to look at, but it does its job, and keeps unsightly things out of sight. 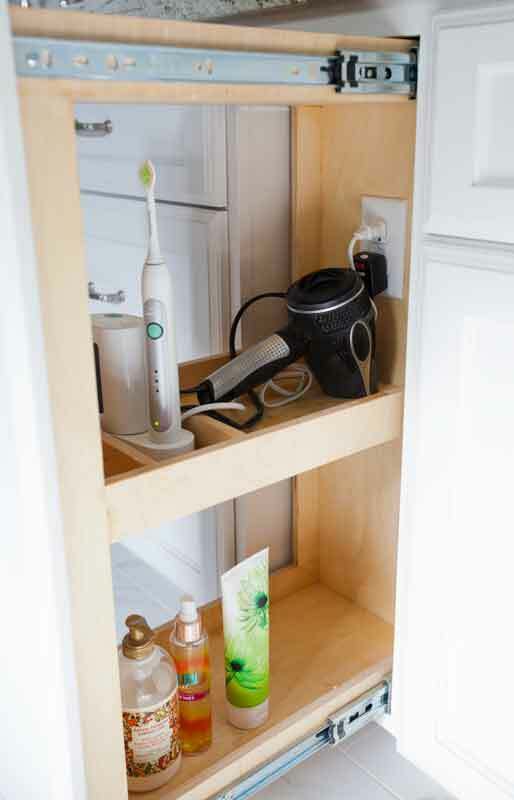 You could also add a little cabinet on the wall to hold your tooth brush. I have the same secret and it does make for a neater counter. I love both of your baths. They are stunning. I would love to know where you got the mirrors if you would share that info. Great ideas. Hey Anita, I love the concept and I’ve seen these before. I just have one question – how does the outlet attach to the wiring in the wall, if you can pull it out? My bathroom vanity is almost the exact same set up. I keep my brushes in the top drawer in compartments that are meant for a kitchen flatware drawer (I’m all about compartments… ;-)) The hairdryer is in the second drawer but I do have to take it out each time and plug it. I could easily have the electrician add an outlet there but I wasn’t sure they could do that since it pulls out from the wall. Lory, I am guessing the wiring is long enough it attaches even when the drawer is pulled out. The electrician did it, so I am not sure. I thought I was the only one with this pet peeve in my kitchen and bath. Nothing drives me wonkier that eerie blue green light from electric toothbrushes in the dark. I like everything tucked away. I would love that! What a fantastic idea! I saw one blogger make a hair grooming shelf in that panel under the sink. But no electrical outlets. Yours completes the thought. I, too, love everything tucked away…even in the kitchen…hate to see the “necessities of life” cluttering up the space, much less the cords! This is a great idea for new homes and remodels! 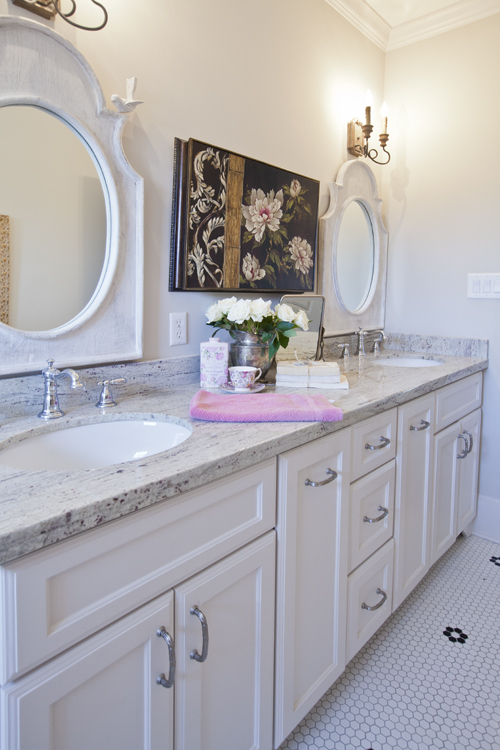 We custom built our home last year and a drawer with an outlet for my bathroom was a must. The builder was all for it, but when it came time for the electrical contractor, he balked. Apparently, this does not meet code in my area. I still got my outlet drawer. It was installed after all inspections were done. So if you are willing to bend the rules a little you too can have this! It wasn’t an issue where I live Lisa. I had the same question about how it is attached when the drawer pulls out? I LOVE this idea and know that Joe could do this. I HATE having our electric toothbrushes out and I keep my dryer in a basket in the closet. UGH. Pinky, my electrician did that. Not sure how he did it. Obviously it required that the wiring still work when the drawer is pulled out. Thank you for sharing! I will start making a list right now. You made me laugh out loud when I pictured a builder with arms crossed and tapping his foot! Love your blog! Great idea. 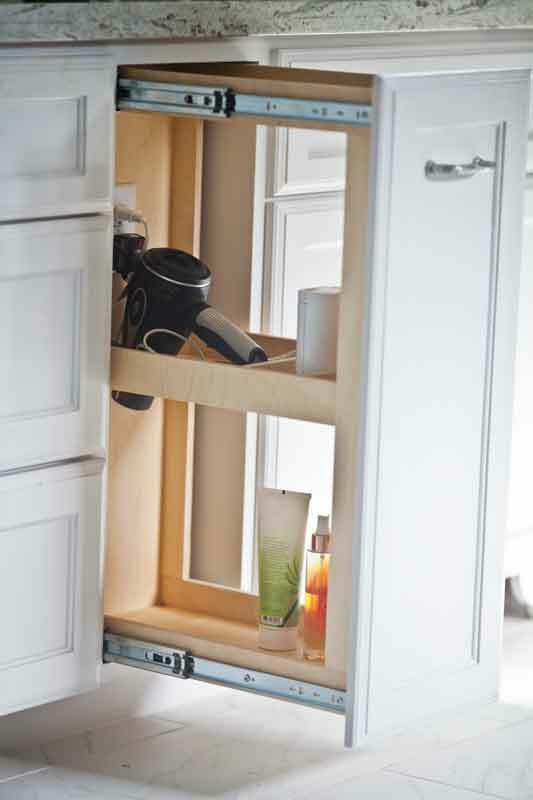 These pull out drawers with hidden electrical outlets are very convenient. Loved the way you decorated the bathroom with lamps and paintings.